If you’re looking for the perfect reptile to keep as a pet, you can’t get much better than a bearded dragon. They originated from Australia where they live in habitats that are close to most human habitations and can thrive in deserts, woodlands, and shrublands. One thing that you will need to decide when getting a bearded dragon is what kind of substrate you’re going to use in their habitat. It will not only determine the kind of environment your pet is going to have, it will also dictate how much work you’re going to have to put in to keep your pet happy and healthy. Do Bearded Dragons Need Substrate? What is the Best Substrate to Use for a Bearded Dragon? If you’re looking for something that’s low maintenance and cost efficient, check out this Zilla Reptile Terrarium Bedding Substrate Liner. It comes in a roll that you can cut to the exact size you need. That means you won’t waste anything which makes this a really economical choice, too. 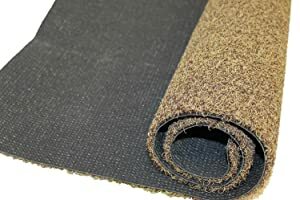 This substrate is made of a non-abrasive, felt like material that won’t irritate your bearded dragon’s feet. Although it’s absorbent, you don’t have to worry about odors. It’s treated with an enzyme that helps break down any lingering smells. When it’s time to clean, all you have to do is rinse the sheet off with cold water and you can reuse it multiple times. It’s really tough and can even stand up to mild scrubbing or soaking if needed. If you’re willing to clean it regularly, this one will last a really long time without losing its effectiveness. This is a good choice for young or juvenile bearded dragons because it’s inedible. Unlike other forms of substrate, your bearded dragon won’t be able to ingest this liner which makes it a safe choice. It comes in brown and green and is available in a variety of different sizes. To recreate a realistic desert environment, Zilla Ground English Walnut Shells Desert Blend is a great choice. It’s made of all natural ground walnut shells that have been processed to a small, uniform size. The look and feel really simulates a desert-like habitat. It’s a good conductor of heat and will encourage your bearded dragon to dig and burrow like they do in nature. Unlike with actual sand, this material won’t scratch the glass of your bearded dragon’s tank. You should cover the bottom of the tank with 1 to 2 inches to give your pet plenty of room to dig. This product is available in 5, 10, or 25-quart bags. The manufacturer recommends replacing the bedding monthly so one bag should last a long time. Something really cool about this product is that because it’s 100% natural you can compost it instead of just throwing it away. 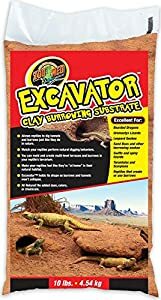 Bearded dragons love to dig and tunnel in the wild and Zoo Med Excavator Clay Burrowing Substrate recreates the experience for them right in your home. The awesome thing about this one is that, because it’s made of clay, the tunnels won’t collapse. Your bearded dragon will love making multi-level burrows and feel like they’re in their natural habitat. This substrate is 100% natural and free from dyes, colors, and chemicals. You have to mix it with water before putting it in the tank but it will harden relatively quickly. Once it’s firm, your bearded dragon won’t be able to ingest it. You can spot clean this substrate as necessary to make it last a little longer. If it becomes saturated or if strong odors persist, it’s time to remove and replace it. You have to monitor it especially if you’re using it under a heat lamp because exposure can dry it out. To say this substrate is high maintenance would be inaccurate. Once you have it in place, it lasts a really long time. 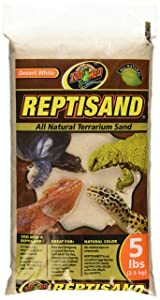 ReptiSand is 100% pure sand that’s very fine but doesn’t create any dust. It encourages your bearded dragon’s natural burrowing instincts and creates a very natural environment for your pets. This substrate is made of fine quartz sand with no added dyes or preservatives. 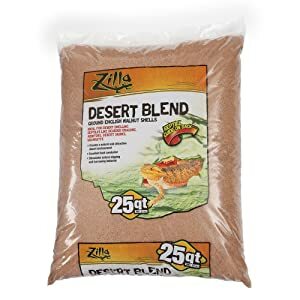 This is a good choice for adult bearded dragons but should be avoided if there is fear of the reptile eating the sand. This substrate is a good heat conductor and comes in a light desert white color. It’s recommended that you fill your bearded dragon’s tank so there’s about 1.5 to 2 inches of sand on the bottom. You can actually clean and reuse this sand over and over again. The process is a little labor intensive but worth the investment if you’re concerned about your budget. Being able to use it over and over again will definitely save a lot of money in the long run. 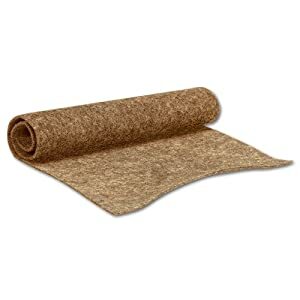 This Deluxe Reptile Terrarium Substrate is a roll of substrate that is textured like short, artificial grass. It’s short and brown in color for a more natural looking habitat. It’s also inedible so you won’t have to worry about your young bearded dragons eating the wrong thing at dinner time. One of the best things about this substrate is that it’s easy to clean and can be reused again and again. All you have to do is wash it by hand or squirt it off with a hose. Once it’s dry, it’s ready for another round in with your dragon. Because this comes in a roll, it’s easy to cut to the exact size you need. That also means that none of it will go to waste. This is an easy, convenient, and economical choice. Yes! Without it, your pet would just be walking along the bottom of a glass tank. As we mentioned, these animals live in a variety of environments and can do just fine with any substrate, but a habitat without one would be too harsh on their feet. Not having a substrate would make it harder to regulate the environment and it would honestly just be really boring for your pet. It’s the material that covers the bottom of your bearded dragon’s habitat. Popular choices are liners, sand, clay, rocks, or even newspapers or ceramic tile. Substrate serves a few different purposes. In addition to making the enclosure look realistic, it gives your dragon a nice walking surface, helps file down their nails, and can even help trap heat and regulate the humidity in the habitat. Plus, certain types of substrate will encourage your dragon to dig and burrow like they do in the wild which adds a level of fun and engagement for your pet. An important thing to mention about substrate is that you have prevent your bearded dragon from eating it. Now, a dragon probably isn’t going to just start eating the substrate but it is really important to be diligent during meal times, especially if you’re using a rocky or sandy substrate. Because bearded dragons love to eat and sometimes gobble down the food, it’s important to feed them in an area where they won’t ingest any loose substrate. Over time, it can build up inside their digestive system and cause a blockage which is a medical emergency can could lead to death. This is especially important for young and juvenile dragons. Because they’re smaller, it will take less material to cause a blockage. Make sure your dragon has a food bowl that allows them to eat off of the substrate. There are many different types of substrate. It’s important to choose the one that will make both you and your pet happy. One of the most important jobs you have as the owner of a bearded dragon is to make sure their home is safe, stimulating, and clean. While you should choose a substrate that your dragon will like, you also need to think about the amount of time and effort you’re able to put into keeping their habitat as it should be. If you don’t have a lot of time to invest, choose something that you can easily clean and change, like a liner or sand that you scoop as you would a cat’s litter box. If you have more time to invest, check out a clay option so that you and your dragon can have fun building and exploring tunnels. Adult bearded dragons can tolerate non-silica sands with minimal worry about impaction. It’s likely they won’t ingest much when eating. Safer sands have been developed that are made of calcium. The theory is that, because it’s made of calcium, it will be easily metabolized in the body. Just to be on the safe side, it’s a good idea to avoid and sandy substrate with young bearded dragons just to be on the safe side. These are small carpets that are made to resemble grass or sand. Sometimes they’re soft in texture but they can also a little rough. Liners like this are an economical and uncomplicated choice. They come in a roll and you simply cut it to the size that you need. Most of them can even be washed and reused so they’re good for the environment and your budget. This material is interesting because it allows you to mold a habitat for your dragon and even gives them a chance to build burrows and tunnels for themselves. Typically, you’ll mix clay substrate with water and mold it to the shape you want. When it’s almost dry, your dragon can explore and build tunnels of their own. It will eventually harden, keeping the shape of the tunnels. You can add faux plants and other accessories into the clay when it’s still wet. Once it’s dry, they will be permanently in place. This substrate lasts a really long time. Plus, there’s no chance your pet will be able to eat it because it hardens so thoroughly. This is a simple and cost-effective way to line your dragon’s cage. It’s not the most attractive option but it will eliminate the fear of impaction. Newspaper substrate will have to be changed more frequently than other types, too, because it stays moist and will start to have an odor pretty quickly. Wet newspaper can also increase the humidity in your bearded dragon’s environment. Some people line the bottom of their bearded dragon’s habitat with ceramic tile. This is the longest lasting substrate but requires regular cleaning and maintenance. The tile should be wiped clean periodically. Replacing it can be a little difficult when the time comes but it is a safe, effective option. While all of the substrates that we reviewed are impressive products, Zilla Reptile Terrarium Bedding Substrate Liner is our top pick. Because you can cut it to the exact size you need, there’s no waste. Plus, we love that you can simply rinse it off in the sink or hose it off in the backyard, let it dry, and reuse it again and again. We like the color options with this one, too. Because it’s available in both green and brown, you can choose what kind of look your bearded dragon’s habitat has. You can also make it resemble desert or woodlands, each a natural habitat. Plus, there are different sizes available so it’s a good fit for just about any habitat. One more thing: your bearded dragon can’t eat it. This means it’s good for all ages, even babies, and juveniles. Bearded dragons are an amazing pet to have and that their low maintenance is just icing on the cake. Choosing the right substrate will help you keep their environment close to their natural habitat and keep them safe and warm. The big thing to be careful about it choosing a loose substrate for baby and juvenile dragons. Material like sand and rocks can be dangerous if ingested so make sure you watch your pet carefully. Or, choose a style of substrate that is inedible to eliminate this concern altogether. Wondering what the best bedding for my Bearded Dragons, I want them to be as comfortable and safe as possible. Thanks any suggestions would be great.